NOW: A bank has long since replaced the resourceful clutter of storefronts. Further east on Jackson, the Bush Hotel, restored and in good health, lets it be known that it is now both fireproof and modern. In the mix of storefront and walk-up businesses in this first half-block on the south side of Jackson Street (north of 6th Avenue,) one could, buy a dress, a watch, rent a Packard, get a bath and/or a haircut, have one’s clothes washed and suit pressed, rent a room with a bed, play pool at the alley, and, no doubt, much more. A likely date for this Webster and Stevens Studio print is 1922 or ’23. Beyond the alley, the Busch Hotel and its services (including a Chop Suey Noodles café,) fill the half-block to Maynard Avenue. The big hotel was built by William Chappell and lovingly dedicated and signed in 1915 for his wife Margaret’s maiden name, Busch. 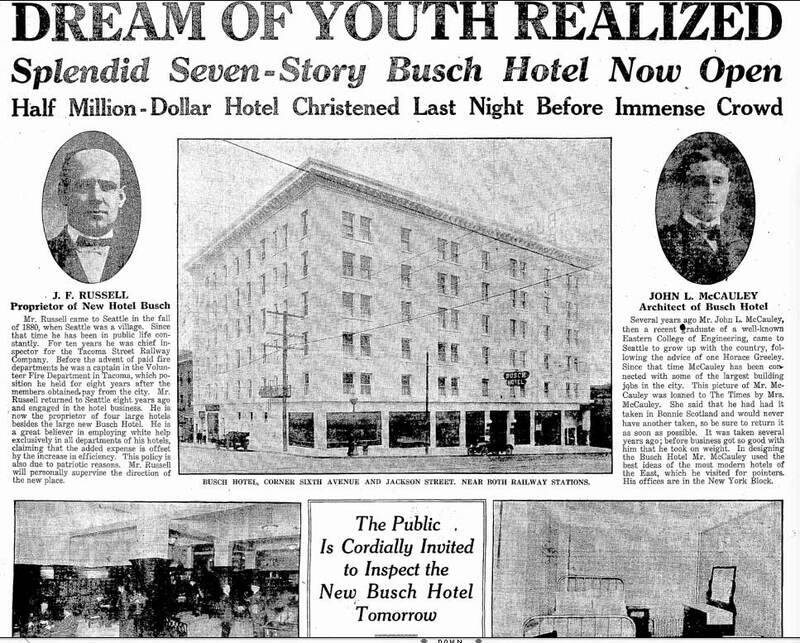 Like most other hotels in the neighborhood, the Busch Hotel hoped to thrive by bedding passengers arriving at the two nearby railroad depots, also facing Jackson Street. After William Chappell’s death in 1921, his estate endured a good deal of “legal squabbling” among his heirs. 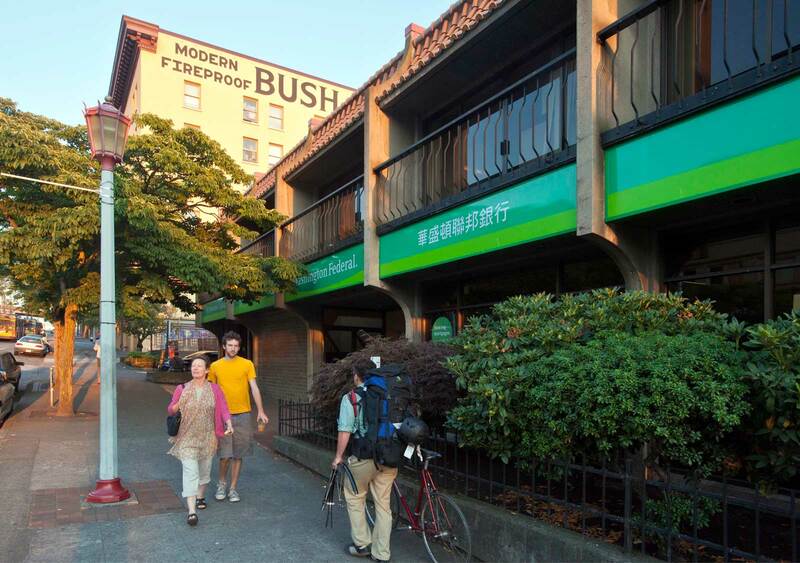 One result was that the hotel’s name was changed from Busch to Bush, a moniker it still holds with its latest “make-over” into affordable housing for senior citizens of the International District. 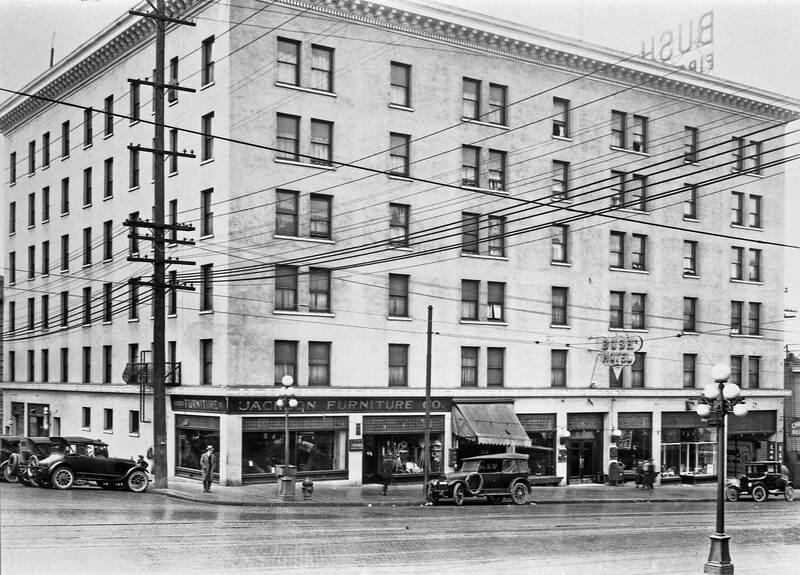 Purchased in 1978 by the Chinatown International District Preservation and Development Authority, the hotel was badly shaken by the Nisqually earthquake of 2001. Tightened and polished it reopened in the fall of 2006. Among the forty-plus thousand Webster and Stevens negatives preserved at the Museum of History and Industry, understandably this one is often used. Jean and I have also used it in the exhibit of “Repeat Photography” at the Museum, (sponsored, in part, by The Times), which we have mounted with our Parisian friend Berangere Lomont. (The show also features now-and-then pictures of Paris.) The exhibit is up until MOHAI’s planned move from the west shore of Union Bay in Montlake to its new quarters at the south end of Lake Union next June. See it before the move if you can and will. There is plenty of bus service nearby and lots of parking too and the first Thursday of every month you can get in free. Otherwise, if you can, pay and support the place. The telephone number there is 206 324-1126. Ooh, I know you’ve much to add this time round, Paul. Nah – not so much. Time has run from me or I from it. I’m not certain who is responsible. I’ll need to drop some features for later, and there may be other opportunities. How pleased I am to see two familiar Sherrards in your “now” repeat of the 1922 or so look east on Jackson. The family is part of it perhaps, I suspect, because it took the shoot as a chance to visit the International District for its cuisine, a lunch perhaps. Now let’s let the reader decide who or which is yours – those whose sox you bend to mend and to whom you prepare the tenderest roast turkey imaginable. You may not do the mending but you surely do the finest roasting. I know you took a picture of the New Years Eve Turkey you prepared, although you took no pictures of any of the guests. 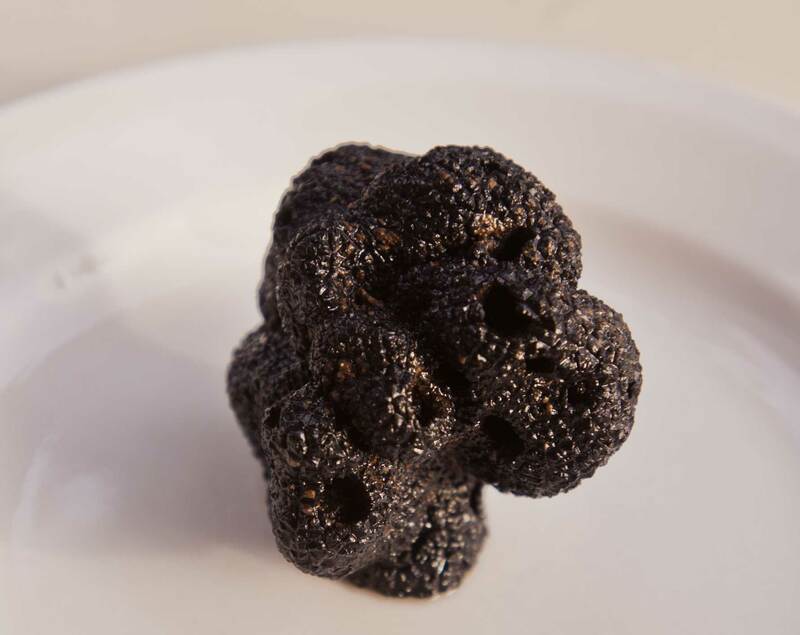 Such is the temperament or concentration of a great chef. How about putting the turkey portrait up below this text? 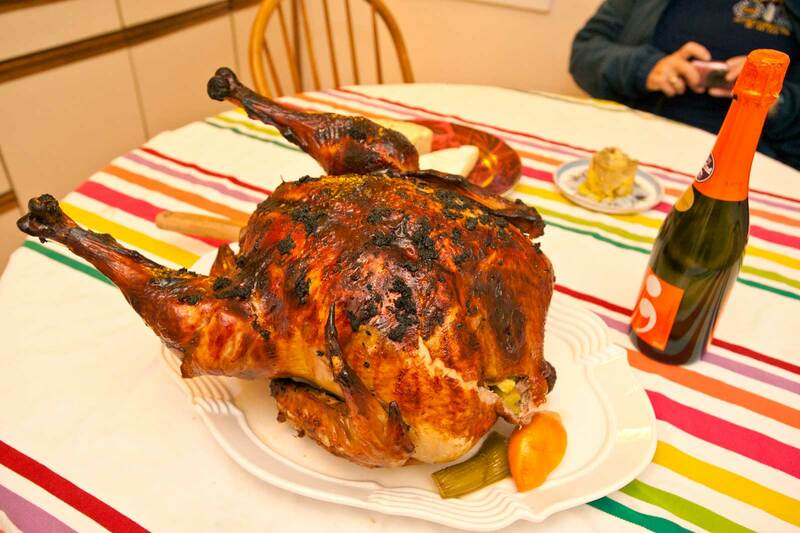 For the hungrier readers the taste of your succulent turkey may then, at least, be imagined. Another Aiko studio print. 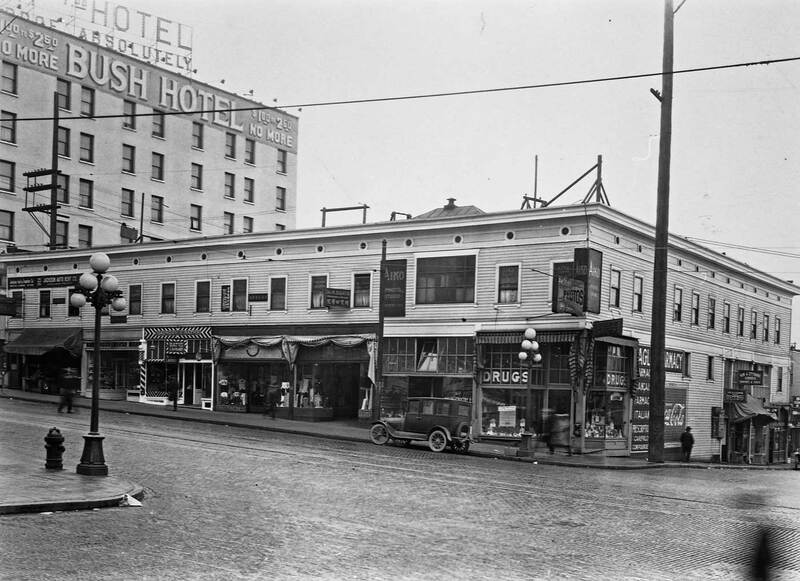 This one also about 1925 and after the Busch Hotel dropped its "c."
Follow now two clips from The Seattle Times. 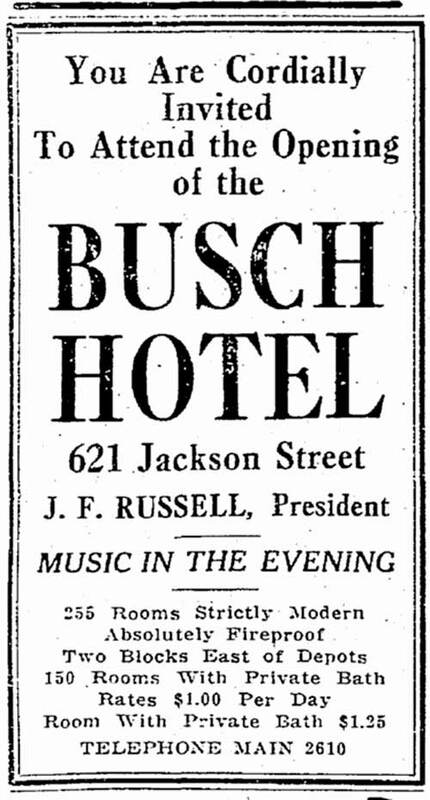 The first one an ad for the opening of the new Busch Hotel, published on Oct. 9, 1915. The second, the graphic part of a long description of the new hotel, and most likely a paid for ad as well. It made it in the Times one day later, Oct. 10. Here’s another neighborhood photo by Okawa. Above and Below: The above mid-1920s portrait of The Waste Laundry at the northeast corner of Weller Street and 5th Avenue was one of a collection of prints by International District photographer Yoshiro Okawa that were loaned to me a quarter-century ago by Tomio Moriguchi of the neighborhood supermarket Uwajimaya. Thanks again, Tomio. Since 2000 the corner has been part of the expanded Uwajimaya. What may we make of the name of this place: The Waste Laundry? The building itself is unique enough, for it is both more and less than it appears. “More” because it was built on stilts high above the tideflats that once flooded this corner of 5th Ave. S. and Weller Street. Below it there are nearly three stories of fill and/or basements. The building is “less” than it seems because it is really pie-shaped. It was built not to disturb the old coal railroad that ran directly behind it at a slant already a quarter-century before the building was constructed as part of a power plant for generating electricity and heat – not laundering – with steam. But what of the name? Scott Edward Harrison, of the Wing Luke Museum, determined through city directories that a C.R. 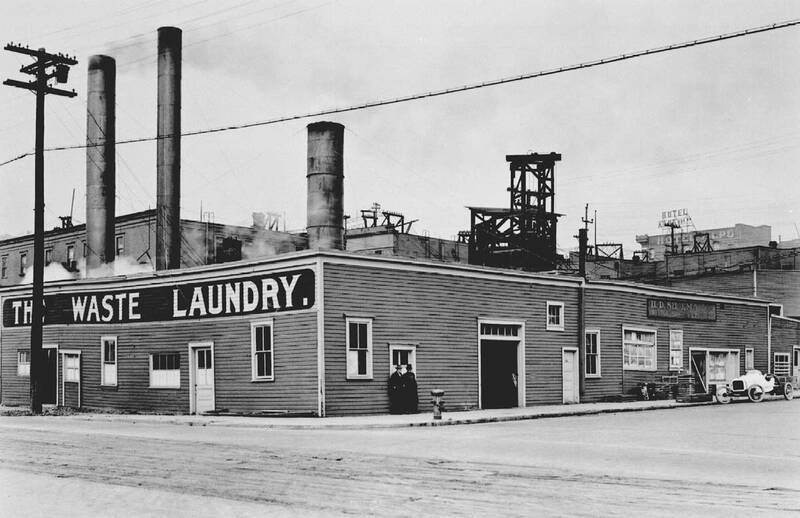 Anderson operated an Overall Laundry at this address in 1919, and changed its name to The Waste Laundry sometime between 1923 and 24. That was not long before Yoshiro Okawa, whose studio was nearby on Jackson Street, photographed it. By 1933 both Anderson and the laundry were gone. Neighborhood tour leader, Lon Elmer, recalls that “waste rags” were once collected and cleaned for the manufacture of high quality paper, although not necessarily thru this laundry. Seattle writer-reviewer Bill White notes that “waste girls” was a common name used for the women who worked in commercial laundries. 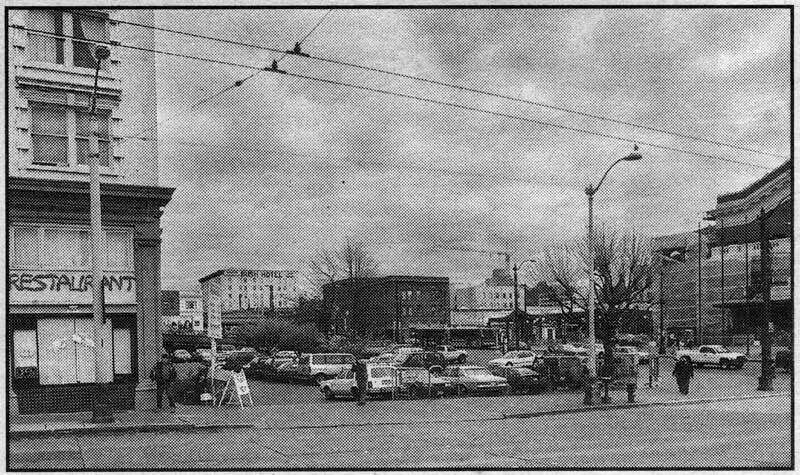 White sites Cynthia Rose’s research and reflections on the often-exploitive practices of Seattle’s power laundries in connection with her and others attempts a few years back to landmark the Empire Laundry in Belltown. We will take Bill White’s lead, and encourage readers to explore Rose’s excellent website www.66bellstreet.com where the culture of waste girls, waste bundles, and waste linens may be delved. The sense of a laundry named for “waste” may be understood then as nearly commonplace. Regardless of the blotches and spots acquired by this photograph as public works chroniclers we cherish it, for photos of early street work in Seattle are extremely rare. Photographer Theodore Peiser came to Seattle from San Francisco in the early 1880s and set up a studio featuring what he claimed on the back of most prints were “the largest and finest backgrounds and accessories in Seattle.” He learned the handicaps of his new home, promising “First-class Work Guaranteed, No Matter How Bad the Weather.” Soon he said he had “the largest and finest assortment of views of Seattle for sale at reasonable prices.” How many we will never know, for Peiser lost most of his stock in the city’s “Great Fire” of 1889. .
Peiser promised to number and preserve indefinitely all his negatives; this view (lower left) has a high one, 65491. (Since there was not way that Peiser could have taken by then that many saved negatives, the number indicates perhaps a promotional vanity or a code privy to the photographer.) Thankfully, this construction scene also shares a hand-written caption, bottom center: “Jackson Street.” Directly above the street name an uncredited free hand has inscribed the date, 1883, and to the right a refinement of the location, between 10th andJ2th Streets. All very helpful and the hand-written locator may even be accurate. Jackson Street was regraded in 1883. Peiser also claimed “all manner of outsIde photographic work executed on the shortest notice; in a superior style.” Perhaps Guy Phinney paid for negative 65491. This "now" for the 1883 regrade record by Peiser was scanned from the newspaper clipping, never the best way to get a satisfying image. The truth is the same old one. I could not find the "now" negative although it is surely somewhere within 20 feet of me in this studio. As with the above 1883 repeat, this one was also copied from the clipping. The Wing Luke Museum, 25 years old this year [In 1992] has mounted its most ambitious exhibit ever. Named for the decree that interned 120,000 mostly West Coast Japanese and Japanese Americans during World War II, Executive Order 9066 is an eloquent survey of a century of Japanese settlement on Puget Sound. The view printed here of the Japanese Baptist Sunday School appears near the beginning of the museum’s fluently ordered space. Most of these children are Nisei (second-generation Japanese), U.S. citizens born here to immigrants. Many, perhaps most, of them will have had their own families when they were forced into internment 32 years after this scene was photographed. This is the Sunday school class of 1910, or so speculates Lulu Kashiwagi, historian for the Japanese Baptist Church. Lulu’s mother, Misa Sakura, sits at far left. The baby propped on her lap is most likely Lulu – born that year. Lulu’s older sister Ruth is behind her, held in the arms of a family friend, Mrs. Mimbu. Three of Lulu’s brothers are also in the scene. 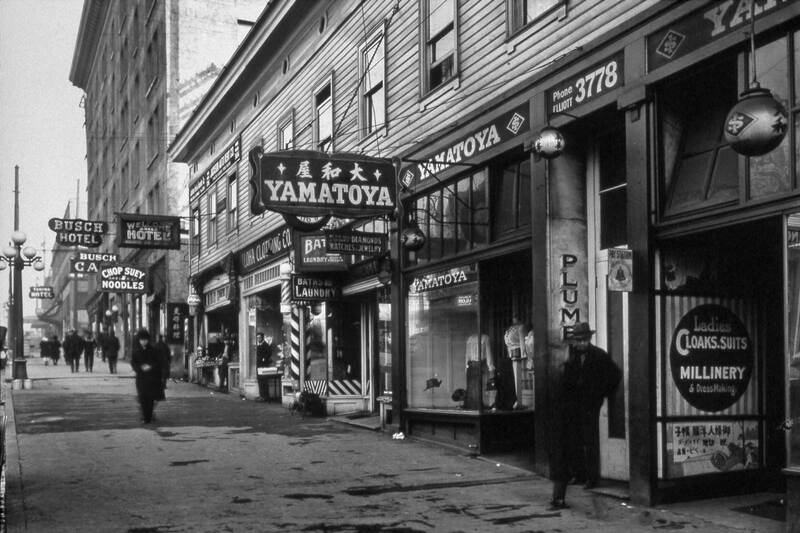 Seattle’s Japanese Baptists trace their origins to a night school conducted by their first pastor, Fukumatsu Okazaki, in the community’s first Japanese lodging house, and then in the basement of its first restaurant. This industry soon developed into a Japanese YMCA and in 1899 incorporated as a church. The Rev. Okazaki is pictured here, top center, holding the “J” card. Churches were the most effective hosts for Japanese workers fresh off the boats. They helped the understandably anxious sojourners find lodging, steered them to suitable employment, conducted English-language classes and offered the security of a caring group for immigrants who had left their traditionally strong family support behind them. Here the Baptist’s Sunday School is posed on Maynard Street. The tower of the King County Courthouse on First Hill tops the scene. In 1908 the Baptists were forced from their sanctuary at Jackson and Maynard Avenue by the Jackson Street regrade. Within two years they moved into a second home, again off Maynard at 661 Washington St. 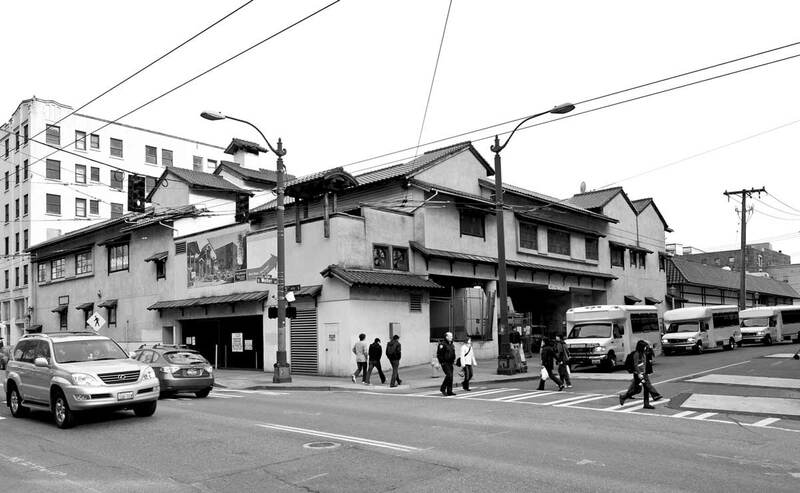 This part of the International District is still predominantly Japanese. With the construction of Interstate 5, Maynard Avenue north of Main Street was abandoned. Kobe Terrace Park, named for Seattle’s Japanese sister city, and the Danny Woo Community Garden have since been developed on the site. 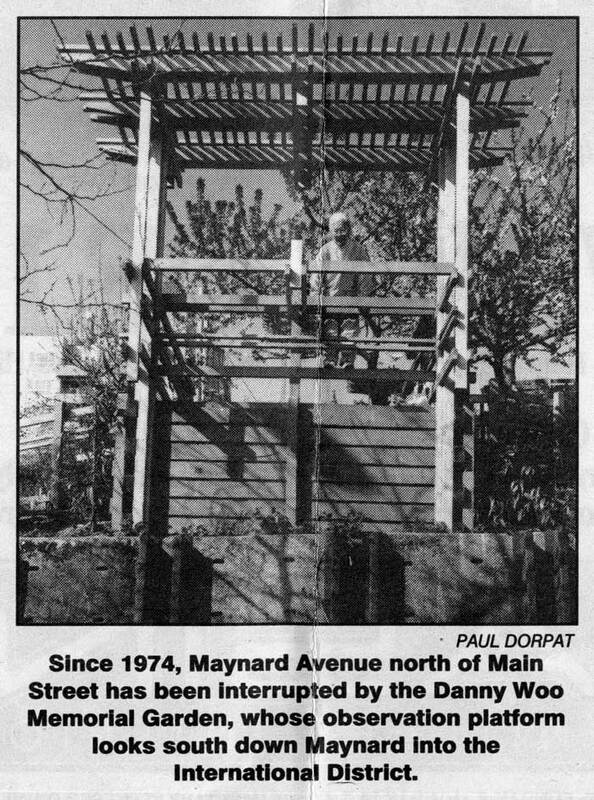 In the contemporary photo, the athletic 82-year-old Lulu Kashiwagi has climbed upon the park’s gazebo or observation tower, which looks down the center of Maynard Street into the International District. The Wing Luke Museum’s exhibit, “EO 9066 1892-1992, 50 Years Before, 50 Years After,” will be shown through August. [Again, like the feature, this exhibit dates from 1992. The museum was then still on Seventh Avenue, just south of Jackson Street. Of all the Seattle streets regraded early in the century, Jackson received the most extensive work. By 1909, about three years after today’s historical picture was taken, more than 3 million cubic yards of soil was flushed from the slope’s flanks and into the tideflats (now the site of the Kingdome). Its grade was reduced from 15 to 5 percent and the top, at Ninth Avenue, wound up 85 feet lower. Another nod for Jackson’s diversification comes from Oennosuke Shoji, founder of the Seattle Japanese Christian Youth Organization on Jackson Street. He remembered the street as being “a hangout for prostitution where about 300 white, yellow and black prostitutes lived.” Most of them came to town in the late 1890s with the gold rush. They were the fleshy side of Seattle’s gilded age. Looking west down Jackson ca. 1888 from near 9th Avenue and so near the highest point on the ridge before it was cut away 85 to 90 feet with the 1907-1909 regrade. That, of course, is Holy Names Academy on the left and West Seattle far off. Note how the tidewater still fills the bay directly south of Jackson and King Streets where the sports stadiums now rest on their own pilings. This view came courtesy of the British Columbia Provincial Archives in Victoria. Another rough "now" scanned from the newspaper clipping. More than most, Jackson has been a street in transition. The first Jackson roughed out from Doc Maynard’s 1853 plat was about two blocks long. It ran between the waterfront and the salt marsh. Those were the west and east sides, respectively, of a peninsula first named Piners Point in 1841 by the U.S. Navy. The third side was the tide flats that extended from King Street south to the estuary of the Duwamish River (near the present Spokane Street) and southeast to the foot of Beacon Hill. 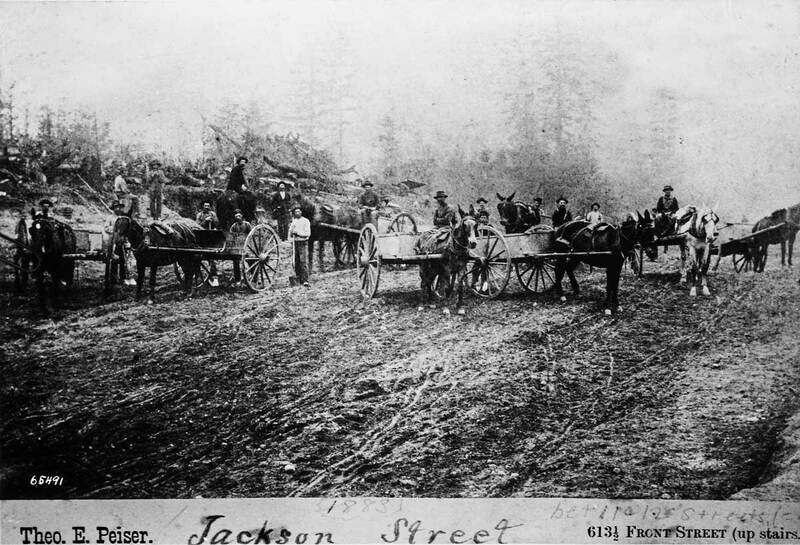 Beginning in 1883, Jackson Street was graded primitively between Lake Washington and tidewater. 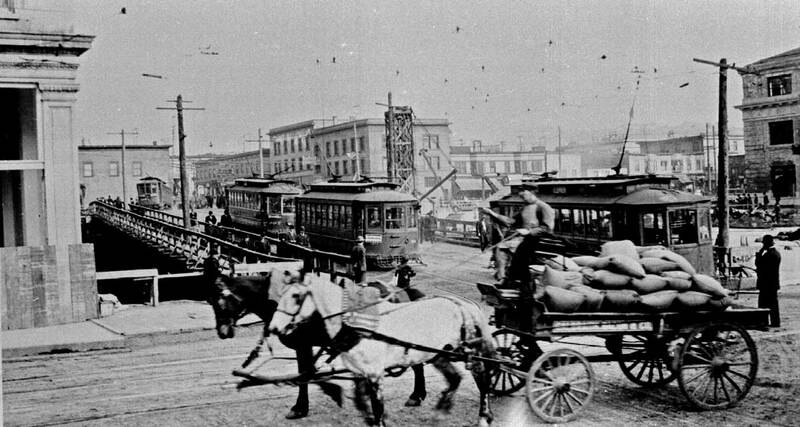 Five years later the cable railway that ran east on Yesler Way to Leschi at the lake returned westbound on Jackson. 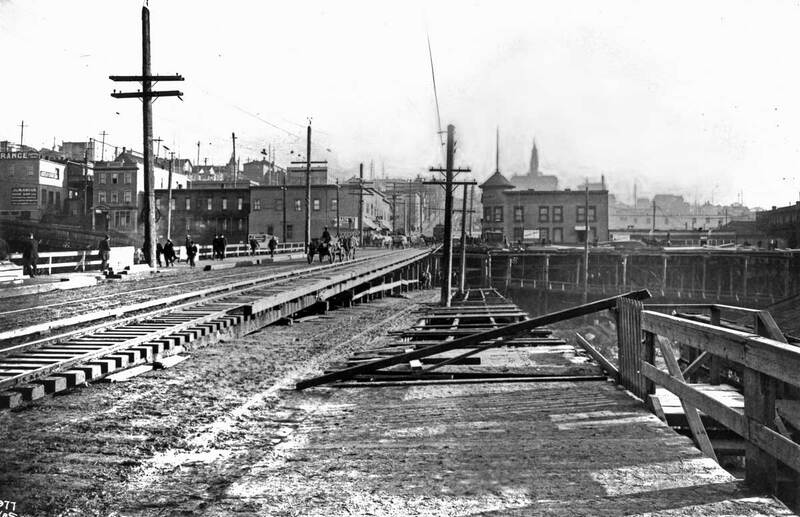 With the rush of development after Seattle’s “Great Fire” of 1889, Jackson Street was improved with a new timber trestle built over the drained salt marsh. In this 1906 view, a Webster and Steven photographer looks east along that trestle from about Fourth Avenue. Just out of frame, left and right, are the tanks and processing plants of the Seattle Gas Company. 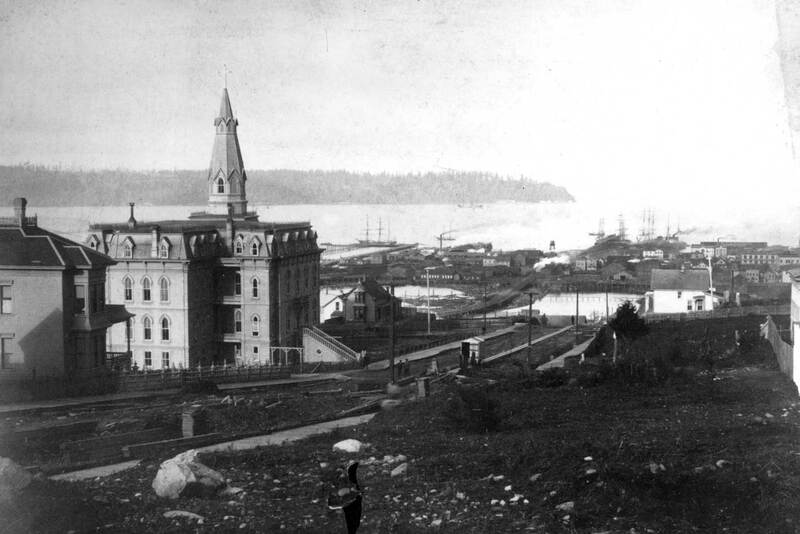 Within a year the company would move to its new Wallingford works (now Gas Works Park) on the north shore of Lake Union. Also within the year began the hydraulics of lowering the ridge – barely seen here on the horizon – that ran between First and Beacon hills. Jets of saltwater shot from cannons did the job. Jackson was lowered 85-90 feet at the first summit of the street near Ninth Avenue. 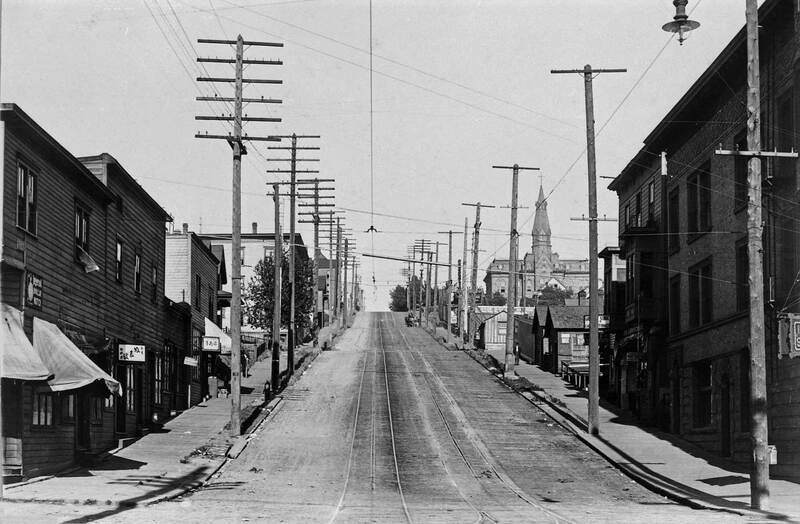 After Denny Hill, this Jackson Street regrade was Seattle’s largest. Among the institutions forced to relocate was Holy Names Academy at Seventh and Jackson. The gray silhouette of its central spire is visible just right of center and above the roofline of the building with its own tower at the southeast comer of Fifth and Jackson. And still more clipping compromises . . . Since Jean started taking the repeats they are kept in better order. 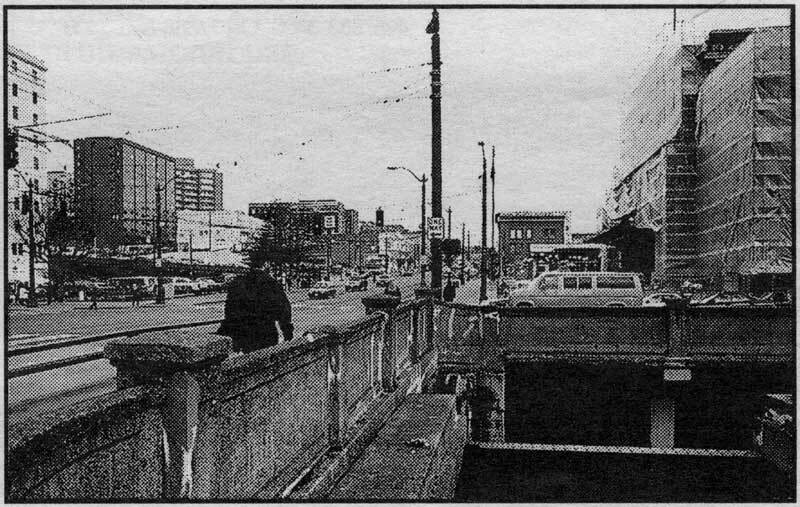 Except for the temporary bridge that carries the middle of the historical scene, the neighborhood revealed in this “then” photo seems much the same as that in this “now” photo. The likely year of the older photo is 1911, since the grandest of the surviving landmarks (the New Richmond Hotel, far left, and Union Depot, far right), though seen only in part, are still clearly works-in-progress. Both were completed in 1911. The photographer looks east and a little south from Fourth Avenue across the temporary timber bridge to Fifth Avenue. In this block, Jackson Street proper, right, has been closed for construction of a concrete bridge paralleling the grand front facade of the combined Puget Sound terminus for two railroads: the Union Pacific and the electric Chicago, Milwaukee and St. Paul. For most “readers” of this photograph, the rolling stock is no doubt the most fetching subject. Four electric trolleys – three of them westbound – test the strength of the temporary trestle. Together the crowded streetcars, trestle and construction work make a tableau of urban enterprise. It is, however, the streaking team and loaded wagon in the foreground that bring it to life. The driver holds the reins a bit firmer in his left hand than in his right, suggesting that the wagon is completing a tum off Jackson. I will take suggestions as to what is in the bags. 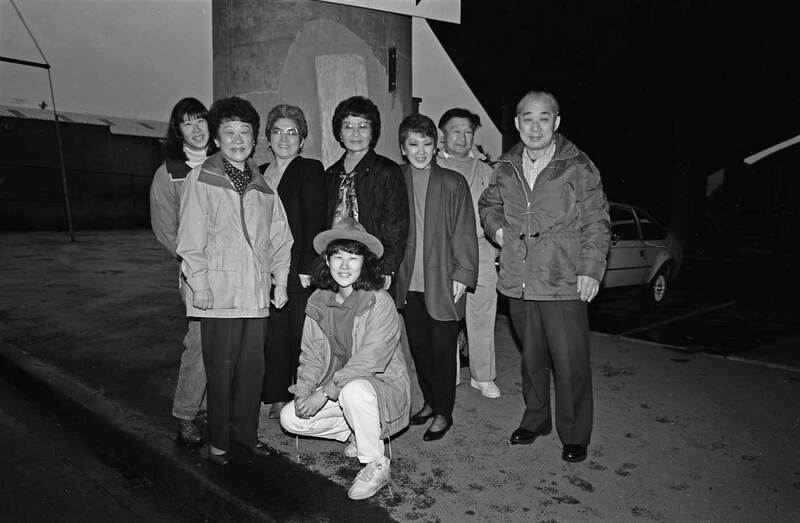 Six of the surviving seven of Tameno Habu Kobata’s children revisited the site of the family’s flower shop, now spanned by the Interstate 5 freeway. They are, from left, Kimi Ishii, Louise Sakuma, Mary Shinbo, Rose Harrell, Jack Habu and John Habu. 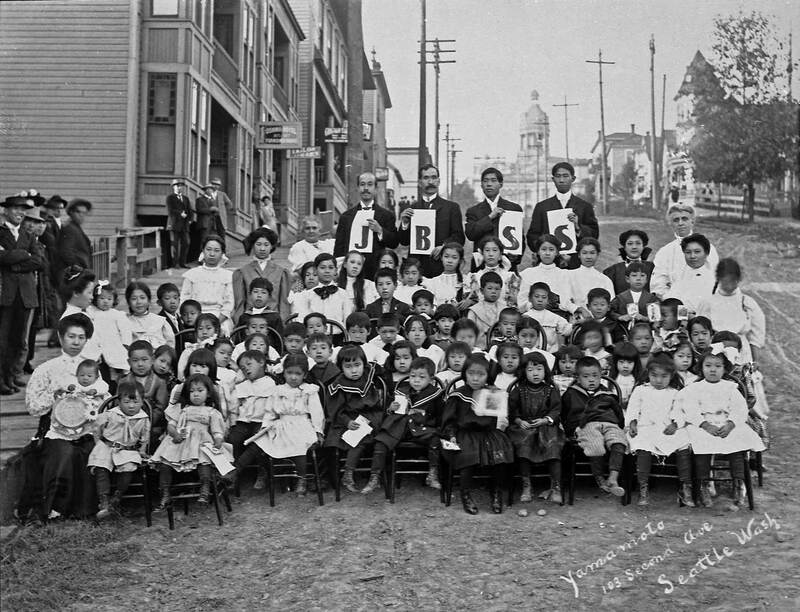 Two of Tameno’s 22 grandchildren are also Included – Linda Ishii, far left, and Nancy Ishii, kneeling. Nancy Ishii Is responsible for researching the elaborate family history. 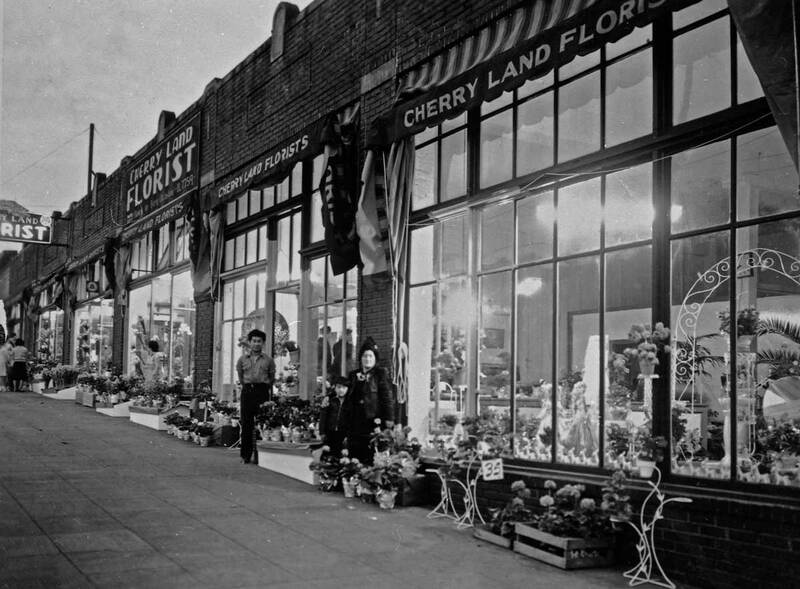 In the 1930s, the decade of the Great Depression, Cherry Land Florists grew from a small grocery store into one of the largest retail flower shops in the International District. These views were photographed in 1941. Ten years earlier Tameno Kobata, her husband John, and their eight children – six from her first and deceased husband, Teiji Habu – moved into the storefront at 905 Jackson St. The flowers, which at first were kept behind the fruits and vegetables, eventually took over, and the Kobatas’ little food store became their Cherry Land. The business was mostly the mother’s doing – the father helped support the enterprise by working a second job as a waiter at the Seattle Tennis Club. The family lived in cramped and often chaotic quarters behind a partition in the rear of the store. A barrel with water heated on a wood stove by fuel scrounged from the neighborhood was the family bath, and the living quarters’ few beds were shared with privacy provided only by blankets hung for partitions. The oldest girls, Kako and Mary, soon became skilled flower arrangers, and the younger children helped de-thorn roses, fold corsage boxes and prepare ferns for wreaths – after they had completed their homework. In the sidewalk scene Tameno Habu Kobata and her second son, John Habu, pose between the flower boxes. John, who left home in 1935 at the age of 14 to make his own way in Chicago, returned “amazed” in 1940 to find his family’s flower shop flourishing. Within a year, with his help knocking away walls, Cherry Land expanded to the entire building. After Pearl Harbor, the business instantly withered. 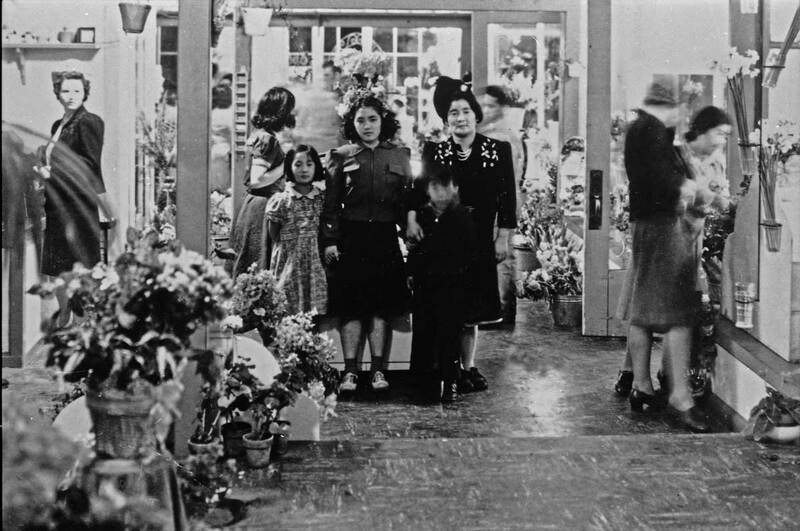 The fear and hysteria of the early days of World War II brought internment for the Habu-Kobata family; and 125,000 other Japanese Ameicans. At war’s end most of the family was back in Seattle. When their industrious mother, Tameno, died unexpectedly in 1948, sons John and Jack returned to Seattle for her funeral and stayed. In the years after her death Tameno’s many children started a variety of local businesses, including three flower shops – among them Cherry Land Two. 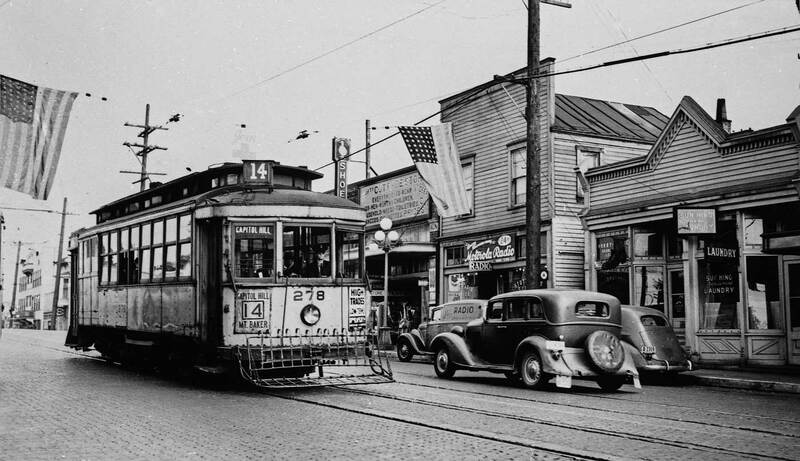 Harold Hill was a trolley fan extraordinare, and one of his devoted efforts was to photograph, line by line, the last days of the Seattle Municipal Railway’s electric trolleys. The Mount Baker half of the Capitol Hill-Mt. Baker line No.14 was abandoned on July 6th, 1940. This is Hill’s record of the old Car 278’s last work, perhaps even its last trip down Jackson Street. The photo also reveals a sample of the commercial culture on Jackson Street a half-century ago. 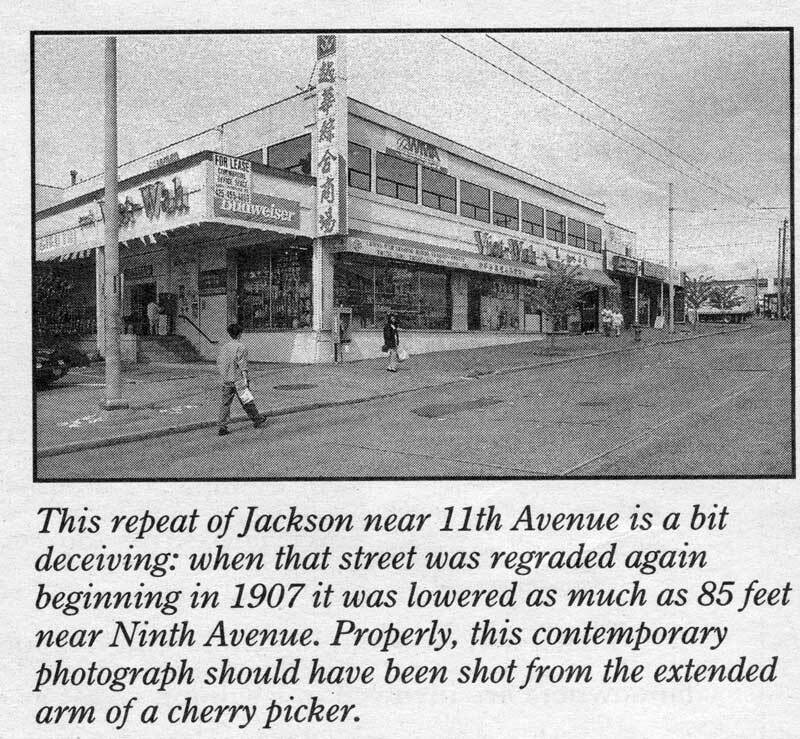 The shops shown here on the south side of Jackson and east of 23rd Avenue include a Chinese hand laundry, Sun Hing; a shoe repairman, Robert Jorgensen; Ernest Stutz’s Radio Service (he lived upstairs), and Samuel Treiger’s Thrifty Cute Rate Store. Jackson’s diversity was both ethnic and economic. In the three blocks between 21st and 24th there were Scandanavian, Italians, Jews and Asians running 22 businesses including a mattress company, service station, bakery, drug store, beauty shop, dentist, beer hall, furniture store and Safeway grocery. The Capitol Hill half of line No. 4 was shut down weeks after this photo was taken. And within a year the rest of the old system was derailed. Most of the cars, including No. 278, were scrapped. PROFESSOR PA VAN TASSELL’S first attempt to lift himself and his oiled silk balloon above Seattle failed for want of gas. 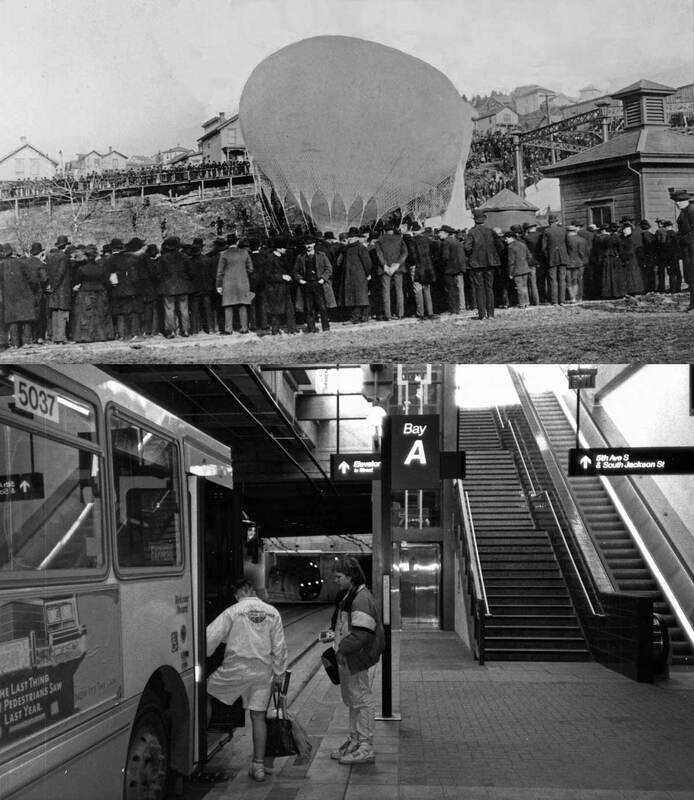 However, the following day, Jan. 2, 1889, the “aeronaut professor” reached lighter-than-air condition and took off at 1 p.m. with his parachute lightly tied to the side of his balloon. In this view, which looks north across Jackson Street to the Seattle Gas Company’s plant near Fifth Avenue, Van Tassell’s balloon is about to lift off. The top of the daredevil’s white parachute is draped to the side of the balloon, which is connected by a 2-inch pipe to the gas company’s storage tank, far right. The ascent did not disappoint the throng that was perched on every available promontory and along the waterfront. Van Tassell cast off his sandbags, waved goodbye to the crowd, and, the Post-Intelligencer reported, “shot off.” At about 2,000 feet the craft turned to the northwest and the waterfront, where a flotilla of tugs, steamers and rowboats took up the pursuit, encouraged by the pilot’s offer of $10 and a silk hat to the first one to pluck him from the bay. His craft rising rapidly, the professor strapped one wrist to a ring attached to his parachute, grabbed hold of the ring with both hands and jumped. The next day’s P-I reported that “Van Tassell’s … descent was indescribably thrilling.” When the parachute at last opened the jolt loosened his grip, and the professor was held only by the strap tied to his wrist. After a descent of about two minutes Van Tassell landed in about two feet of water a short way offshore near the foot of Denny Way. The balloon landed in a tree at Smith Cove. realize that there was a counterbalance. By the look of it the street must have “plateaued” or leveled off to about a 1 to 2% grade between 9th and 12 av. Also the view from Holy Names toward the sound must have been magnificant.